Locate your coffee pot and a tumbler—a wax-paper soft-drink cup will work in a pinch—that fits inside when turned upside-down. Carefully unwrap (don't tear!) one or two of those premeasured filter-packs that came with your coffee service and stuff it gently into the cup. Ideally you want four parts water to one part coffee, but this is tough to estimate with filter packs. Fill the remaining space in the cup all the way up with water. Tap water works; filtered or bottled is better. Try not to leave any air bubbles. Don't worry if it seems it will result in a tiny amount of coffee; it will be concentrated, intensely flavored, and—assuming you're not stuck with decaf—highly caffeinated. Invert the coffee pot over the top of the very full cup, lower it until the rim of the cup seals firmly against the inside of the bottom of the pot, and carefully flip the whole assemblage over. Under Earth-normal conditions, the twin phenomena of surface tension and atmospheric pressure will keep the water in the cup, the coffee packs will float to the surface, and there will be very few air bubbles.If you’re feeling nervous about this step, practice it over the bathtub without the filter pack. In the morning, pull the cup straight up, allowing the contents to spill out. 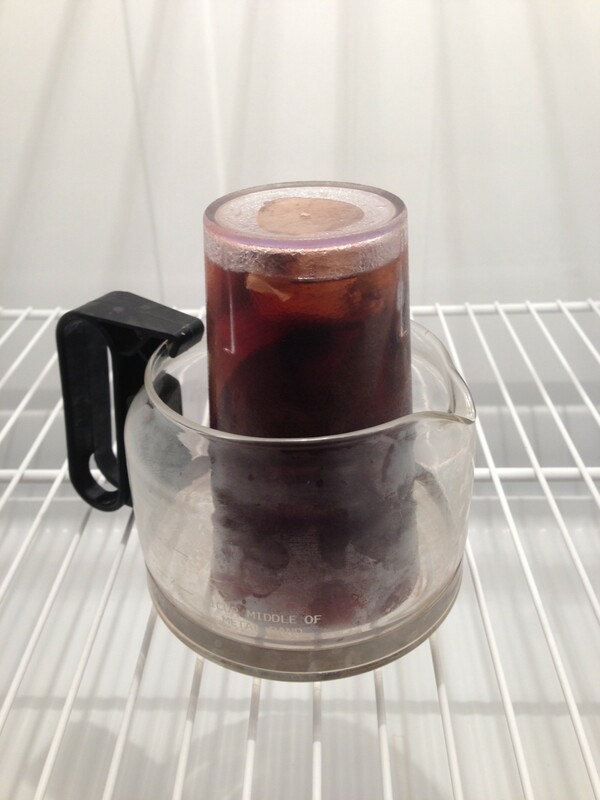 Fish out the filter-pack and enjoy lovely cold-brewed coffee! Widgeteer, Pinterest. Still eating pixels and crapping fun after all these years.